What is borax? What is it used for? While borax is not an herb, it is nevertheless an important component of traditional Chinese herbal medicine. Borax is actually an ore, a type of crystal consisting mostly of sodium. 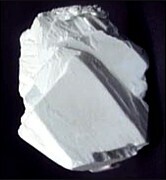 Borax ranges in color from transparent to white to light gray, and is usually opaque. In China, it is produced mainly in the Qinghai province. It is mined, then crushed into a fine powder and cleaned before use. According to the principles of traditional Chinese medicine, borax has salty and sweet properties, and is associated with the Lung and Stomach meridians. It can be taken internally or externally. Internally, borax helps to eliminate sore throats, coughs and congestion, and excess phlegm. Externally, borax can be applied to the skin as part of a wash to clean and disinfect wounds. It can also be used as type of eye wash.
How much borax should I take? The amount of borax to be taken depends on the condition being treated. The typical internal dose of borax is between 1-2 grams in pill or capsule form, taken up to three times per day. Borax may also be applied to the skin; the amount to be used varies depending on the condition and the area of the body it is being applied to. What other forms of borax are available? Borax can be found in pill, powder and capsule forms, which can either be consumed internally, or used as a wash or poultice for external applications. Borax is also included in some formulas used to treat sore throats and congestion. What can happen if I take too much borax? Are there any interactions I should be aware of? What precautions should I take? Borax is considered safe. As of this writing, there are no known side-effects associated with taking borax, nor are there any known drug interactions. However, patients on salt-restricted diets should consult with a licensed health care provider before taking borax or any other mineral or supplement that contains large quantities of sodium. As always, make sure to consult with a licensed health care provider before taking borax or any other herbal remedy or dietary supplement. Cavazza A, Corradini C, Lauria A, et al. Rapid analysis of essential and branched-chain amino acids in nutraceutical products by micellar electrokinetic capillary chromatography. J Agric Food Chem August 2000;48(8):3324-9. Chen X, Zhang J, Xue C, et al. Simultaneous determination of some active ingredients in anti-viral preparations of traditional Chinese medicine by micellar electrokinetic chromatography. Biomed Chromatogr November 2004;18(9):673-80. Wallace JM, Hannon-Fletcher MP, Robson PJ, et al. Boron supplementation and activated factor VII in healthy men. Eur J Clin Nutr November 2002;56(11):1102-7. Wester RC, Hui X, Maibach HI, et al. In vivo percutaneous absorption of boron as boric acid, borax, and disodium octaborate tetrahydrate in humans: a summary. Biol Trace Elem Res Winter 1998;66(1-3):101-9. Zhao S, Pan Z, Chen X, et al. Analysis of the aconitine alkaloids in traditional Chinese medicines by nonaqueous capillary electrophoresis using a new recording mode. Biomed Chromatogr July 2004;18(6):381-7.